We moved house about 6 weeks ago and finally, FINALLY… we have internet! I brought over our mini modem however reception at our new place (which is only 2km from our old place but at the end of a cul de sac) is pretty much non existent. Posting my Dr Who Tardis Rainbow Cake and Dalek Cupcakes was an act of sheer will power! Remember dial up internet speed? That’s what I had to work with, I’d press a button and then go and do a few jobs as I waited for the page to load. After many many many many many many hiccups (as my 4 year old likes to say in order to emphasise his point) our ADSL modem finally arrived on Friday. The first thing I did , was look up the recipe schedule for Tuesdays with Dorie: Baking with Julia! And oh what a great week to return! It’s perfect in its simplicity. And I will make it again and again and again! The recipe calls for one recipe Perfect Genoise. 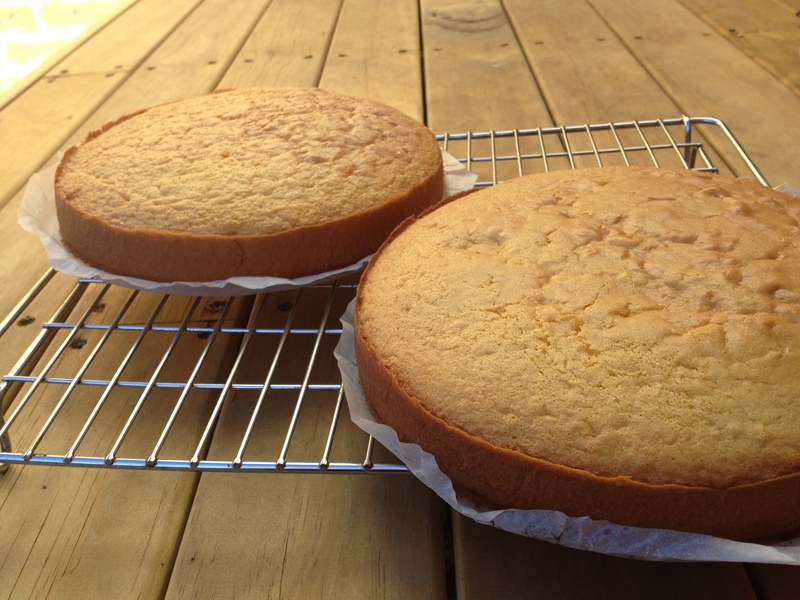 However, the recipe clearly tells you the Perfect Genoise “is drier than most American cakes”. I baked two, split them in half to make four, but luckily, I ran out of my sugared strawberries and ended only using three layers. I broke bite sized bits off the fourth layer and dipped these into the strawberry juices and then scraped the last bits of cream on top before popping them in my mouth. I kept going until both bowls were clean. If there was more I would have eaten more. Instead I had to wait until after dinner for more. Here is where the lesson comes in. This cake is dense (as the recipe says!). There was too much sponge for the amount of strawberries and cream in it. So (in hindsight) one genoise split into three (as the recipe says!) would have tasted better. I can not wait to see what the other members of Tuesdays with Dorie thought of this recipe. And if you would like to check out the actual recipe and give this cake a go for yourself, head over to Sophia’s Sweets or Think, Love, Sleep, Dine. Tags: baking, cakes, cooking, cream, food, french food, recipes, strawberries, Tuesdays with Dorie | Permalink. Glad to see you are settling in – moving can be such a pain. Glad you enjoyed it, I didn’t love it though!! cake scrap snack–i like your style! yes, this was a good one. 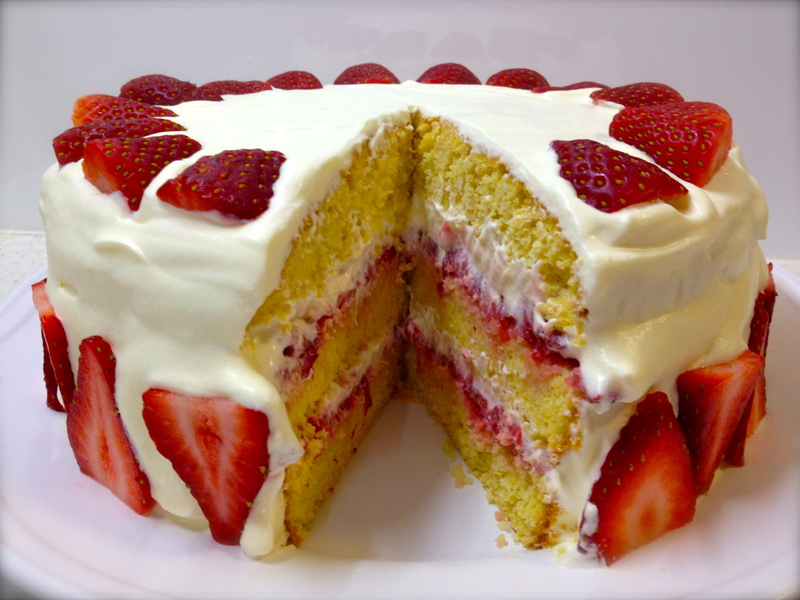 the cake absorbes the strawberries and cream and becomes much less dry. Great story. Your cake turned out lovely. U’ve done such a brilliant job!! can’t get over the first pic.. gorgeous!! You did a wonderful job Sanya. Glad to hear you now have ADSL. Beautifully done, Sanya! And welcome back! Congrats on the move! Your cake looks delicious and perfect! Love that first pic, just gorgeous! Welcome back to the cyberspace! …and into your new home. What a delicous cake as a start! Cake looks great! I like how you rotated the strawberries around the bottom edge. Congrats on being reunited with DSL. 😉 Your cake looks beautiful! I admit, the filling on this one was my favorite part. Beautiful cake. Congrats on the move. It is so beautiful! I am envious! Looks delish! What an incredible looking cake. I skipped this one because I didn’t want to eat it all myself, but it so gorgeous. I’ll have to look out for an occasion to make it. Hope your internet connectivity is back to “normal”. Congratulations on your new home.